One of the most common questions I get asked most on Quora is, “How do I build a Whatsapp bot?”. It’s a popular topic too, articles about Whatsapp Chatbots get thousands of views every week. However, most of them are just advertisements for services wrapped up in informational decoupage. So I decided to write a comprehensive piece about Whatsapp Chatbots. In this article, I will chronicle everything from why Whatsapp came to be monetized to how you can build one for your company. You can skip to whichever section you find most useful. Whatsapp was started by two ex-employees of Yahoo!, Brian Acton and Jan Koum. So in 2007, they left Yahoo! and used a vacation in South America to decompress. Pictured – Brian Acton (left) and Jan Koum (right). In 2009, Jan Koum began building Whatsapp. Whatsapp 1.0 was fairly simple, it’d allow users to put up statuses that would be displayed near their names. That’s it, no messaging features. As Apple launched push notifications, Koum tweaked Whatsapp so users would get notifications when someone in their network uploaded a status. Why is Koum's story important? Because it explains the thought process that went into shaping Whatsapp as a product. Jan Koum was born in Kiev, Ukraine, in almost pitiful poverty. His house had no hot water and phones weren't used for fears of being spied on. This may seem distraught, but Koum longs for his days in rural solitude. In fact, it's one of the reasons he hates advertising. Whatsapp 2.0 is when it starts to look like the app you and I know today, complete with a messaging function and those iconic double check marks. This bumps their user base to 250,000. Whatsapp has come leaps and bounds since where they first started. At 250,000 users, Koum’s old Yahoo! 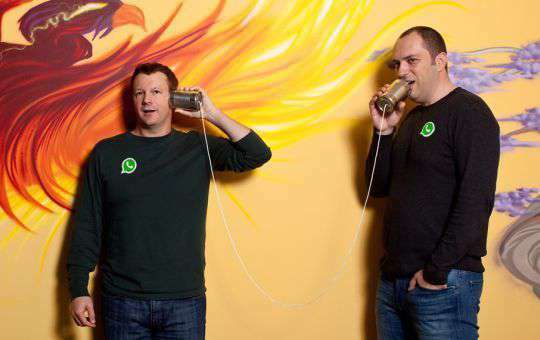 buddy Brian Acton joins the Whatsapp team. As their user base grew, they had to artificially neuter growth so that they wouldn’t scale too fast. So they switched Whatsapp from “free” to “paid”. But even with that $1 price tag, user growth kept increasing exponentially. By 2011, a year and a half after 2.0 was launched, Whatsapp cracked the Top 20 iOS store list. Through all this, Koum and Acton were working for free, eating into their own savings. But they were hesitant to raise money. Acton, especially, saw VC funding as a bailout. But after getting Sequoia to promise not to push advertising models on them but act only as a strategic advisor, Whatsapp raised $8 million for a 15% stake in the company. Two years later, Whatsapp raised another $50 million in secret from Sequoia, at a valuation of $1.5 billion. So putrid was the Whatsapp team's hatred for marketing and advertising, that Whatsapp very rarely partook in advertising or marketing themselves. During a dim sum lunch with staff, a colleague asked Koum why he wasn't talking to the press about their product like so many other founders in Silicon Valley were. Because they refused to engage in any of the capital-intensive marketing functions other startups did, they saved a lot of money. When they were raising their Series B $50 million, Acton took a screenshot of WhatsApp’s bank balance and sent it the partners at Sequoia. It read $8.257 million; in excess of all the money they’d received years before. When the $19 billion dollar acquisition of Whatsapp was announced on February 19th, 2014, everyone took notice. To put into perspective, $19 billion meant that Facebook valued the 55-employee Whatsapp more than companies like Harley Davidson, American Airlines, Ralph Lauren, UnderArmour or Xerox. The deal translated to roughly 11 percent of Facebook’s market value at the time. In comparison, Google’s biggest deal was its US$12.5 billion purchase of Motorola Mobility, while Microsoft’s largest was Skype at US$8.5 billion. Apple, meanwhile, at the time had never done a deal above US$1 billion. It also rewarded the VC firm that had originally invested in Whatsapp. Sequoia Capital received a 50x return on its initial investment through the deal. So how did Mark Zuckerberg convince the famously “anti-establishment” Koum to join one of the largest advertisers in the world? For starters, Facebook wasn’t the only company interested in Whatsapp at the time. Google offered to pay $10 billion dollars for Whatsapp. The deal was subsequently rejected, in part because the bid did not come with the promise of a board seat, unlike the Facebook agreement. Tencent, maker of Whatsapp competitor WeChat also tried. Tencent CEO Ma Huateng revealed that Tencent was in the final stages of completing a purchase of Whatsapp. However, Ma Huateng’s back surgery delayed the talks just enough for Facebook to come and double Tencent’s bid. $19 billion is a lot. But friendship is worth a lot more. Zuckerberg and Koum had been friends since early 2012, when Mark invited Koum for coffee at a bakery in Los Altos. They spoke for over two hours and created a friendship that would get deeper with time. The two began to meet frequently, going for hikes and dinners together. At dinners, Mark began to talk about a possible merger of Facebook and Whatsapp. They talked about Zuckerberg's Internet.org initiative and how Whatsapp could help with it. Mark used his deep pockets and existing relationship with Koum to sweeten the pot. Zuckerberg’s final pitch was on February 9th, 2014, at his California house when he had Koum over for dinner. Koum said he’d take a few days to think it over. Five days later, on Valentine’s Day, Zuckerberg was having dinner with his wife at home when Koum showed up, strawberries in hand. They then negotiated a price. Five days after that, on February 19th, the $19 billion deal was finalized. While Whatsapp was popular before Facebook purchased it, it really took off in the months following the acquisition. In August 2014, WhatsApp was the popular messaging app in the world, with more than 600 million active users. Little more than a year later, its user base increased to 1 billion. By the end of 2018, that number stands at nearly 2 billion. On its own, Whatsapp’s massive customer base is reason enough to incorporate it into your customer-facing business functions. But there is a larger effect at play. As far back as 2016, Big 4 Messaging Applications (Whatsapp, Messenger, WeChat and Viber) had more monthly active users than Social Media’s Big 4 (Facebook, Instagram, Twitter, and LinkedIn). One, consumer preference is shifting to a more personalized means of communication. And two, Social Media is no longer the unkillable beast it used to be. Think of all the companies that now have messaging as a core product offering. Companies like Facebook Messenger, Twitter, and Snapchat. Messaging is easier, more casual and most importantly, non-intrusive. Companies that fail to integrate messaging into their customer engagement and marketing strategies will suffer; just as the companies who failed to implement social media suffered in the years prior. Finally, the big question. There are two ways to build a Whatsapp Chabot, depending on the size of your company. If you’re an SME, you can get started right now. First though, you’ll need a Whatsapp Business profile. So let’s start with that. You need two things to set up your Whatsapp Business profile. iOs folk, you’ll have to wait. It’s nearly here though. You have everything, now it’s just a matter of running through the process. Here’s a step by step breakdown to help you glide through it. Enter your mobile number in the field. You can either use a landline or a mobile number. You can either get verified through text or if you’re using a landline, you can opt for a confirmation call. You will get a verification code, enter it into the field. All that’s left is your company details. Remember, once you set your business name you CANNOT change it. To begin, head to “Settings” – “Profile”. Inside “Profile”, you can change your business address, category, description, business hours, email address and website URL. Setting these details up is important, but it isn’t strictly necessary. A Whatsapp Business profile will give you access to messaging tools, stats, a dedicated account, and a web-based interface allowing you to interact with your customers. You can automate a lot of the grunt work from inside Whatsapp Business, much like a chatbot would do. Set up greeting and away messages. Let’s start off with automated messages. The human who runs your Whatsapp Business account isn’t going to be available 24/7. So it’s important that you have a system that lets your customers know when you’re offline. These are called ‘away’ messages. Go to “Settings” – “Business Settings” – “Away Message” – “Activate Away Message”. Here, you can set the default message that gets sent to your customers when you’re offline. You can determine the conditions under which away messages are triggered. You can set them to permanent (always send), for specific time periods (lunch hours) and outside of business hours. In the same vein, you can also have a greeting message that is sent to your customers. These are triggered when they message you for the first time or after 14 days of no activity. Whatsapp Business can also aid you with customer support, by creating “quick replies”. Say, for example, your customers often ask you how long deliveries take. The answer is quite long and would take too much effort to individually enter for every interaction. Simply assign a keyword to the answer such as “/delivery”. Now when a customer asks you a question, you can use “/delivery” as a quick reply. Once you’ve set up your system, it’s just the matter of having people text you on that number. Whatsapp makes this easy, through a feature called “click to chat”. You can read about it at length here. Simply insert the button on your website and watch your customers pour in. For larger businesses, it’s a bit more tricky. Whatsapp is working with select partners (so you’ll have to build a Business profile like we detailed above to stand a chance at qualifying). You can apply for the program here. This may take weeks or months, depending on Whatsapp. Alternatively, you could use Verloop to build a chatbot in under 5 minutes. Now that you’ve built your chatbot for Whatsapp, you have your other platforms to think about. Your website, app or Facebook page are undoubtedly large generators of revenue and traffic. But customers who visit them are often left unattended or unaided. Your customers are there to ask questions, and get answers. They want to know more about that product, about what the shipping is like and where the nearest store is. But because they’re on a computer miles away, one of two things will happen. And when customers in your target market are left untouched, they eventually go to one of your competitors. Most times, to the one that answered their question quicker. The end goal for all conversational marketing is simple; Make business personal again.